When I hear the word “breathe,” I immediately think of one of my favorite bands. Needtobreathe’s “Something Beautiful” is a song that weaves its way into my everyday life often. I think about how we’ve seen them live three times and I’d see them three hundred times more. I’ve been wanting to go to a concert lately. Needtobreathe would always satisfy, but I like live music in general. Music helps me breathe, which, really doesn’t make sense because I can’t carry a tune and I quit playing the clarinet the week before band camp was supposed to start my freshman year of high school. With Rend Collective, Ellie Holcomb, and I Am They playing in the background, I’ve found ways to breathe this week. I went on a field trip with one child and took another to a doctor’s appointment two hours away. We’ve eaten carry out and leftovers. I’ve given away two trash bags and a box full of items and dropped off two bags and two bins of recycling. I’ve worked a puzzle with my oldest and read a chapter book with my middle. I’m getting ready to cook food – for us and the friends joining us this weekend, for families who welcomed babies into their homes. to catch our breath are beautiful. I’m joining Kate Motaung and the Five Minute Friday writing crew. The rules are simple: Set a timer and write for five minutes flat on whatever that week’s prompt is. 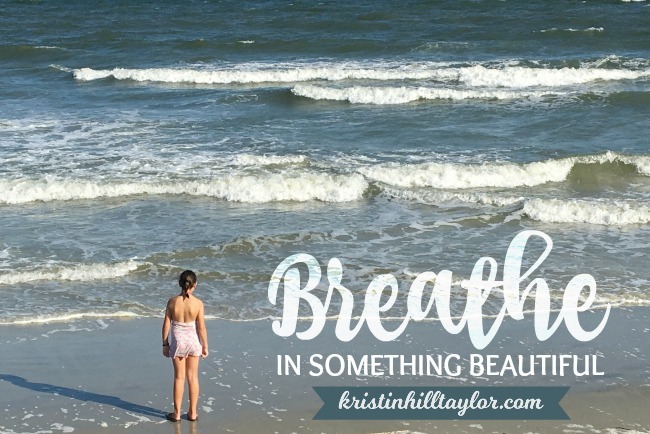 This week is BREATHE. Just write. Don’t edit. Don’t overthink. And then link up at Kate’s place. And if you don’t know Needtobreathe’s “Something Beautiful,” you can listen here. “I’m in reach because I’m on my knees.” O! Yes, Lord. A million times over. Love you and your heart Kristin! You are serving HIM well, very well. I’m still looking forward to the day we get to meet in person. Your encouragement blesses me. Love you! I love that song, but they are actually one band I haven’t seen in concert yet. Ohh and Rend Collective…love them! Funny thing is music often helps me catch my breathe too. But I can’t carry a tune either! Sounds like you had a good week. I’m in the 6 spot th S week. They’re so good live. And yes, Rend Collective is another favorite around here. Hope you’ve had a good week too. Happy Friday, Tara! Yes! I know who you are! Hope y’all are getting settled in well in your new house. Me too on music helpingbuou breathe. It has such a way of helping me release worry and tension. Thanks for stopping by, Marvia!